Clos-o-Mat has produced a new white paper to help architects, builders and housing providers to create lifetime homes with accessible bathroom facilities. It is important that people are able to remain in their homes for as long as possible; updated design criteria for lifetime homes argues that bathrooms should be accessible, and the home’s structure should be able to accommodate the further provision of a ceiling hoist. 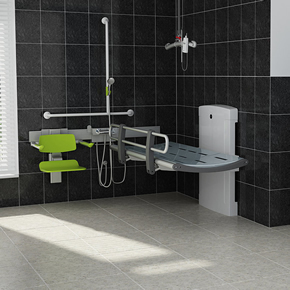 Ceiling hoists, such as Clos-o-Mat’s ceiling track (X/Y) model, are designed to provide the necessary support for the users, whilst being simple for carers to operate. To accommodate them, and other personal care assistive technology, certain structural considerations must be taken into account. Clos-o-Mat’s latest white paper – entitled Design Guidance and Consideration for a Domestic Accessible Toilet/Wetroom – advises on such considerations. Covering everything, from the space required to manoeuvre a wheelchair to the role of colour and texture in accessible bathroom facilities, the white paper has been developed to encourage architects, builders and housing providers to consider the need to adapt lifetime homes at the design stage. It can be downloaded via Clos-o-Mat’s website, which also features CAD blocks for domestic and commercial toilet and washroom environments.